A home-built PC is sort of like a project car. Once you’ve put every carefully-selected piece together, you get a huge sense of accomplishment. But for some enthusiasts, doing things by the book is never enough. And so we get tricked-out street racers and silky-smooth custom rides on the road, and — in smaller but no less obsessive applications — the PC case mod. Case mods range from subtle to striking, from basic to bombastic. Most of the time the machines inside are running state-of-the-art hardware, but that’s just a means to an end — the true joy here is the simple “wow” that these computers get from a first glance. Let’s have a look at some of the more outrageous case mods shown off in trade shows or enthusiast sites. This case and base pair is designed to look like a tough-as-nails military truck roughing it across inhospitable terrain. The motherboard and GTX Titan graphics card are cleverly stored in the truck’s “bed” — note the eight RAM DIMM modules fashioned like cargo rails and the water cooler and fan on the “cab.” The name comes from the TUF series of motherboards manufactured by Asus. This build was created for promotional purposes and displayed at the Asus booth at Computex 2015. This unique wooden case uses modern components, including an embedded monitor and keyboard, to emulate the look and feel classic mid-century consumer electronics. 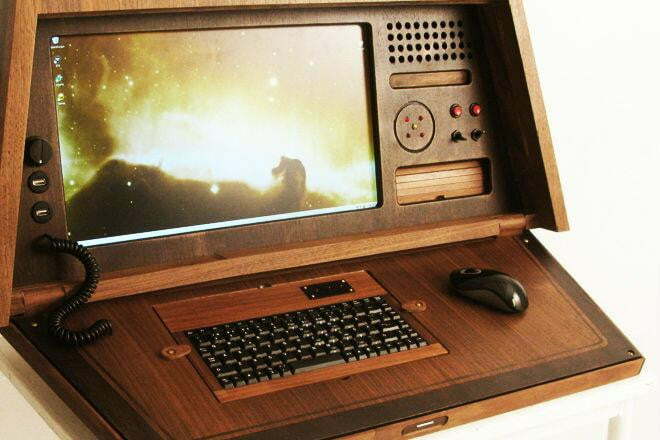 The custom case folds up into a locked cabinet, making it look more like some family heirloom than a computer. Creator “quizz_kid” spent months designing and woodworking, and when he was done, he made his own custom “Sputnik” brand labels and retro-futuristic advertising for the project. In the world of Marvel’s Thor, technology and magic are the same thing. 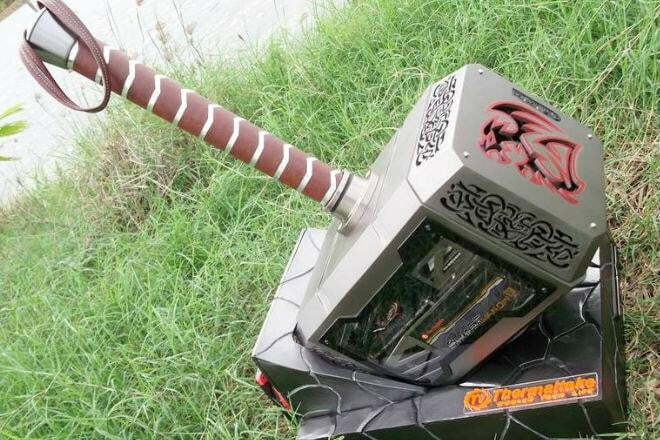 That’s easy to believe when you look at this case mod designed to resemble Thor’s battle hammer Mjolnir. The components are split between the hammer’s head and the base it’s crashed into (sorry, you can’t pick it up no matter how worthy you are). Details like the cracks and filigree aren’t just decorative: the case’s mutli-colored LEDs shine through all over. This is another promotional case mod, this time made for Thermaltake at Computex 2015. A case modder going only by “Sheyr” posted this exhaustive project to the TechPowerUP forums way back in 2005. 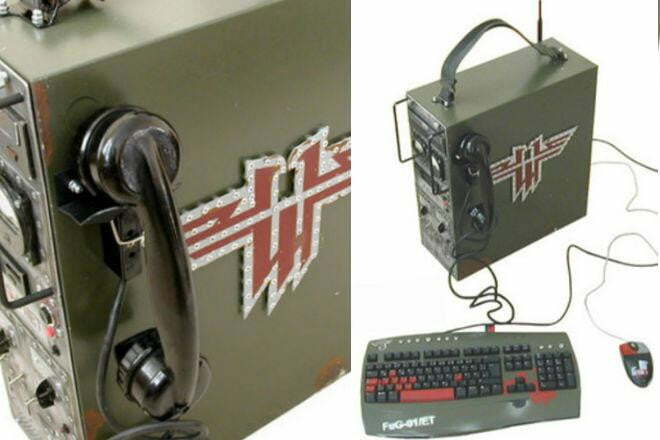 In addition to a tower case heavily modified to look like a World War II field radio you might see while attacking Castle Wolfenstein, the case comes complete with a custom-painted mouse and keyboard set, and a real antique earpiece. The gauges on the front show the computer’s current power consumption. This case mod is little more than an extremely thorough paint job, but it shows what dramatic effects you can achieve with skill, patience, and great design. 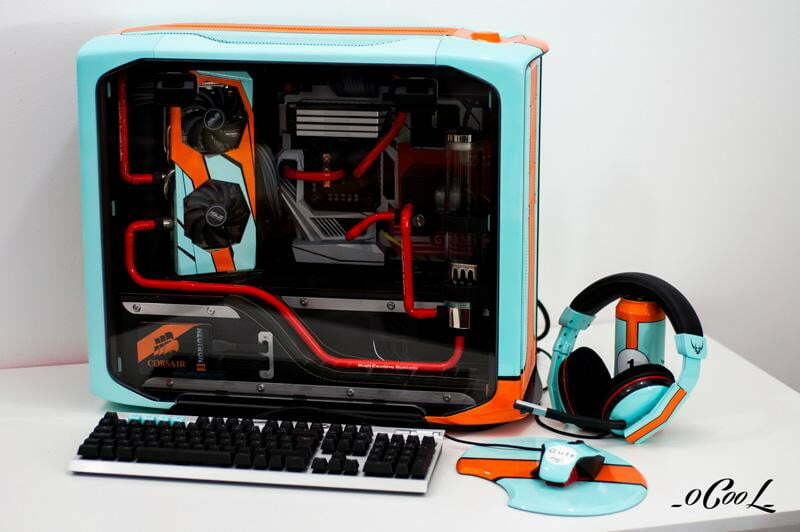 It combines a Corsair case with internal components, mouse, and a headset painted in the iconic orange-on-blue shades of Ford’s GT40 Le Mans race car. This PC may only go fast in the figurative sense, but it turned heads at Corsair’s booth at the 2015 Gamer Assembly. 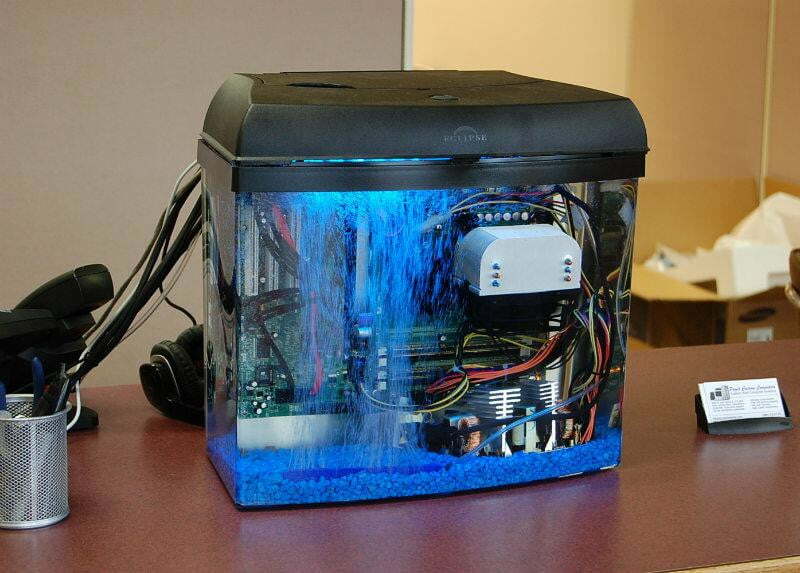 Most PC enthusiasts don’t let water anywhere near their precious electronics. It’s a good thing, then, that this project PC submerged in a fish tank is suspended in non-conductive mineral oil, which actually helps regulate the temperature of the computer. These computers require relatively little skill to build and operate – a company called Puget Systems sold them for years, and they’re easy enough to replicate with a standard aquarium and some salvaged parts. Eventually you’re going to have to put that magnificent custom PC on a desk… unless you cut out the middleman. Peter Brands has been doing just that for years. 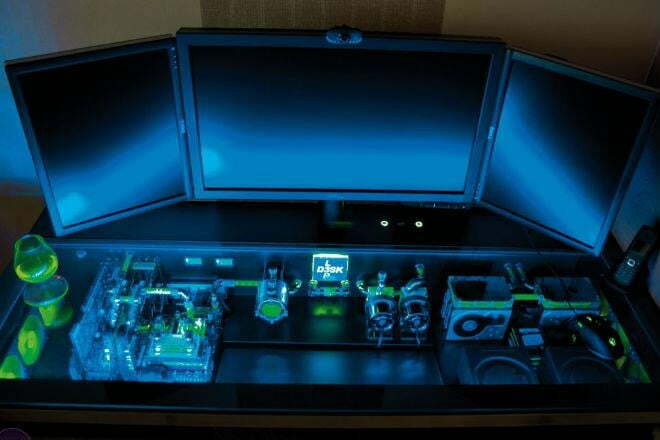 His “L3p D3sk” isn’t the only computer desk with components spread out across the interior, but the liquid-cooled, neon-soaked result is surely the most spectacular of its kind. The project won BitTech’s coveted Mod of the Year in 2011. Most of the more wild case mods dispense with practicality right away. Not so with this prototype case from Asus and In Win. 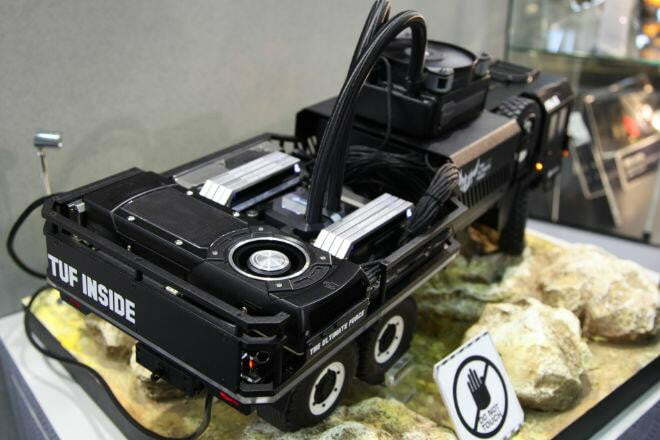 At Computex 2015 the two companies showed off a motorized case that splits apart and raises the interior frame up at the push of a button, instantly granting access to the internal components. It’s a dream for PC gamers and overclockers who love to tinker, but they might not have to dream for long — representatives at the show said that the case may go into production for retail sale at some point. For players of Valve’s Team Fortress 2 PC shooter, a Level 3 sentry is either a thing of beauty or death on a tripod, depending on whether you like to play as the engineer. One modder decided to make his favorite shooter toy into a PC in 2008, cramming the various components into a custom-made enclosure based on a Shuttle design. 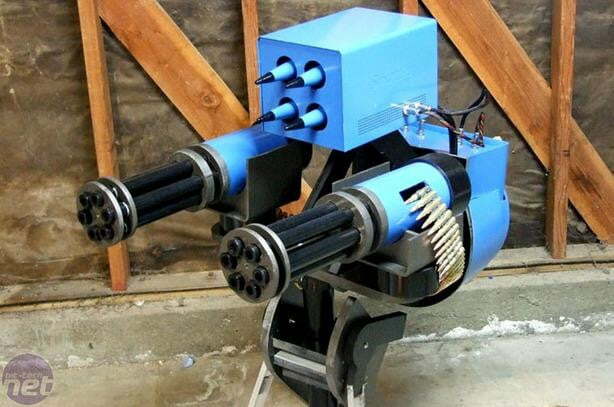 The heavily-modified original case is the top-mounted rocket launcher. The belt of bullets extending out of both mini-guns is — hopefully — decorative. Some case modders start with a relatively simple foundation, like a Thermaltake 10 retail case, and build on until the result is all but recognizable. Take the AzTtec, for example: this foam-covered masterpiece looks like the kind of time-warped technology that would send the Ancient Aliens producers into a tizzy. 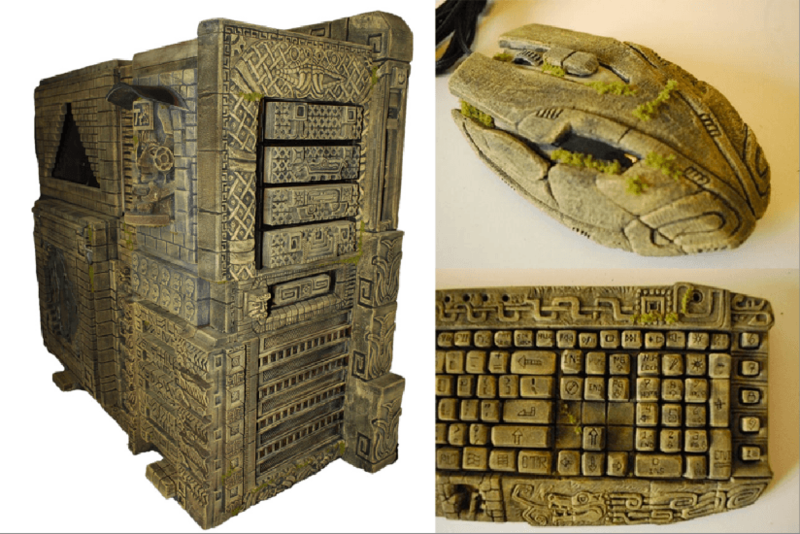 Once you’re done admiring the case itself, check out the amazing custom work on the mouse and keyboard.